Every so often you need fluffy bits of pop culture to float into your life. If I were writing about National Cotton Candy Day, this post might be airy and swirly like the brightly-colored confectionery itself. But I’m not writing about spun sugar. And whatsmore National Cherry Pie Day invariably brings to mind a bloody quote from “3000 Miles to Graceland,” which I won’t repeat because it really is that crass. But you know what is the opposite of crass? The image of blushing cherry blossoms on the breeze. And like the light brush of petals gliding on the wind, did this holiday sneak up on you too? Don’t worry. I’m sure we can all take comfort in knowing this made-up day of celebration is optional and meant to enrich our lives, much like the cherries that go into the pie, with a tart reminder that life can be a sweet bowl of cherries if we so choose it to be. That and the obvious: pie makers across America and some cherry lobbies will also benefit from this choice. And in that way we all can grease the giant pie pan that is capitalism. I prefer this kind of thing to say celebrating National Oil and Gas Day: where we all gas up and commit to driving around the whole day to see who can empty their tank first. Rewards for such feats include gas station gift cards, fast food coupons, and drive-in movie theater tickets! I hope what I just wrote is biting satire and such a thing doesn’t actually exist. Because this is a clear case where being ironic isn’t actually funny. No one tell the oil companies I came up with a plan to use up gas by telling people to patronize businesses that cater to drive-thru culture. Alright. You know you can’t just throw something like this out there without looking into it further, and like Pandora I just had to lift the lid on this box. And hey, look, amid all the terrors I just unleashed, I found some hope! Turns out there is a National Petroleum Day and it’s not as bad as originally conceived. They also call it Oil and Gas Industry Appreciation Day and the focus is reducing oil dependence by promoting alternative forms of energy. Ok. peeps. I’m not the Splendid Table (an NPR show that has been lampooned on SNL for being a little bit ridiculous). And I think that quote I won’t recite should be a good indicator that I’m not going into exquisite detail about the qualities of each of these cherry pies and their makers, because it might end up more gory than sweet. Word. Call them up and get some pie. They need 48 hours advance notice if you’re ordering. I have done take out cherry pie because a friend of mine likes Twin Peaks and hosts retro watch parties occassionally. 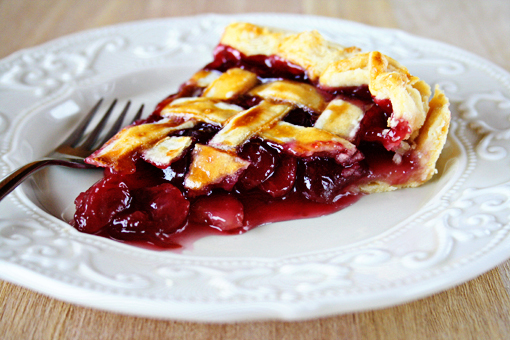 Cherry pie is kind of a big deal in the show. And while I’m not a terrible baker at all, I do run short on time and what little I have left over is not spent on making pie. Pie Junkie is not cheap though, not that it should be, but I want to prepare you for sticker shock should you be used to picking up a Homeland or Crest pie. Which do not match up to this kind of pie, so seriously, don’t even think about those in-store pies when you read about this one. When I got mine a few months ago it was $18 for the whole pie. They source their cherries from a place that individually flash freezes each piece of fruit and they use a mix of sweet and tart varieties. Also their pie is packed with fruit and doesn’t have a lot of filling. If you’re still reeling from sticker shock, sigh, ok. Well, also know you can also take your sweetheart out for pie instead of coming home with a huge $18 pie. I believe most by-the-slice pies are in the $4 range, although they do Pi Happy Hour: where all slices are $3.14 from Tuesday through Friday from 6-7 p.m. They also bake pies with the Pi symbol so expect to see those coming up on Pi day, which is of course on 3/14/14. I took this at last year’s Plaza District Festival. Walnut sugar crumble pumpkin pie is so delicious. If you can get past how adorable this child looks, do you see that sweet couple in the background. I know. Pie can bring out the best in everyone. This is good choice for the budget conscious who are looking for a whole pie to themselves. If you’re not familiar with Brown’s Bakery, they’re a good bakery in the heart of Midtown. And their filling is made with fresh fruit. A large pie is available by order (call 24 hours in advance), although sometimes in the store too, and it costs $12.50. The thing about their large cherry pies that differ greatly between La Baguette and Pie Junkie: crumble topping vs double crust. If you’re still reeling from sticker shock. Sigh. Ok. $3.50 is what it costs for an individual size pie from Brown’s. It too has a crumble topping. But you get what you pay for and this is why you won’t see Homeland or Crest pies on this list. Other notes: I only chose local places, so please no complaints about not including offerings from Whole Foods or Sprouts as an option. I’m not saying they’re not as good, they’re just not free-standing bakeries based exclusively in this area. Maybe I am a little bit like the hosts and guests of The Splendid table in this regard. Screw it. For the DIY-ers in the audience. Here is a recipe that changes it up as this fruit filling is more fruit than goop and it has a lattice style crust. Recipe via Mama Peggy. Tagged Brown's Bakery, Cherry Pie, Crumble, Crust, DIY, Filling, Fresh, Frozen, La Baguette, Mama Peggy, Midtown, National Cherry Pie Day, norman, NPR, Oklahoma City, Pi Day, Pi Happy Hour, Pie Junkie, Plaza District, SNL, The Splendid Table, Twin Peaks. Bookmark the permalink.